Aemulus Holdings Bhd, a Penang-based electrical and electronic (E&E) engineering company in the semiconductor tester industry, is scheduled to be listed in ACE Market of Bursa Malaysia on 15th September 2015. The Initial Public Offering (IPO) consists of 87.79 million new ordinary shares and offer for sale of 43.885 shares at an IPO price of RM0.28 per share at RM0.10 par value. 96.565 million shares will be for private placement & selected investors, 21.943 million shares to the Malaysian public and 13.167 million shares for eligible directors, employees & business associates of Aemulus Holdings Berhad. The IPO will raise about RM24.581 million in proceeds. Out of this, RM12.881 million will be use for working capital, RM6 million for R&D expenditure, RM2 million for purchase of property/plant/equipment, RM1.2 million for marketing/branding/promotion & the remaining RM2.5 million is for listing expenses. With the IPO, the company will have new automated test equipment (ATE) and new research laboratory at the Aemulus headquarters in Penang within 2 years. Aemulus Holdings will develop a new ATE used for checking integrated circuits used in wireless applications and cloud computing. The wireless applications and cloud computing segments contribute over 50% to the group’s revenue. The company also makes ATE for checking ICs used in LED automotive lighting, infotainment of luxurious cars, and wearable wellness devices. Currently, the ATE will be exported to Singapore, China, the United States, South Korea, the Philippines, Thailand, and Germany. The company is exploring new markets such as Taiwan and Japan. Direct export sales contribute about 60% to the group’s revenue, while the remining 40% are sales to multinational corporations in Malaysia. More information regarding the company can be found in Aemulus Holdings webpage. For the time being, Aemulus Holdings does not have any fixed dividend policy. The table below is the financial summary for Aemulus Holdings Bhd. TA Securities is the principal adviser, sponsor, managing underwriter, joint underwriter & joing placement agent of the IPO. For those who are interested in Aemulus Holdings IPO, you may subscribe at ATM machines or via Internet Banking. The subscription period is opened until 3rd September 2015 at 5pm. Tentative balloting date is on 7th September while the allotment date is on 11th September 2015. 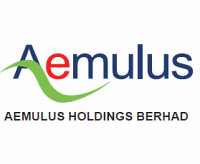 Aemulus Holdings stock name in Bursa Malaysia is “AEMULUS”. View Aemulus Holdings prospectus in Bursa Malaysia webpage. What do you think about Aemulus Holdings IPO? Are you going to subscribe?